Return to the Valley, the Japanese American experience after World War II, tells the story of what happened to the Issei and Nisei generation when they came back home after internment. The documentary begins with the journey home from the camps, then talks about the Nisei generation taking over the rebuilding of their community. In addition, the program describes the emotional and psychological impact of the internment and resettlement on the Issei generation. Return to the Valley also looks at the end of the small family farm in the Santa Clara and Central Coast areas, as well as what happened to the Japanese American presence in the fishing and fish processing industries in Monterey. The documentary concludes with today's Japanese American community and San Jose's Obon celebration. Return to the Valley is narrated by award-winning former ABC News reporter and San Francisco Bureau Chief, Ken Kashiwahara. Return to the Valley received the 2004 regional Emmy Award for outstanding community program. Return to the Valley is available on DVD. Mark's award-winning music is a blend of ancient Asian aesthetics and smooth jazz. Director of the Asian American Jazz Festival for over 16 years, Izu gained international recognition for pioneering Asian Jazz. Izu is a founding member of the Asian American Jazz Orchestra, whose recording received a Grammy nomination in 2000. In 2002, he completed Kuan-yin: Our Lady of Compassion featuring his teacher and mentor, Gagaku Master Togi Suenobu. 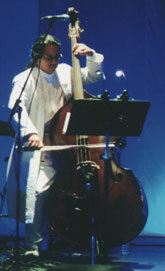 Izu's works include: Mermaid (1997), a monodrama written by Brenda Wong Aoki and scored for full symphony, commissioned and conducted by Maestro Kent Nagano; Last Dance (1998), a multimedia jazz and taiko commemoration of Japanese American Internment during World War II, commissioned by the US Congressional Civil Liberty Public Education Fund; and SunCycles (2000) performed by Circle of Fire, featuring master musicians Togi Suenobu (Gagaku) from Japan and Zakir Hussain. Izu's film scores include Steven Okazaki's Academy Award-winning Days of Waiting and Wayne Wang's Dim Sum Take Out. His theater scores include Lawrence Yep's Dragon Wings (performed at the Kennedy Center, Lincoln Center, and Sundance Festival) and Brenda Wong Aoki's The Queen's Garden (Dramalogue Award for Best Original Music & INDIE Award for Best CD. He recently scored the Emmy nominated PBS television documentary Return to the Valley and his new film score of Sessue Hayakawa's silent master piece Dragon Painter will be released on DVD in 2004. A founding faculty member of the Institute for Diversity in the Arts at Stanford University, Izu continues to teach & perform internationally and recently was commissioned to compose the score for a Chinese production of Racine's Phaedra to premiere in Hong Kong & Paris in 2005. 1) When did the forced evacuation and internment occur? 2) Why did some families choose on their own to move away from the coastal areas? 3) What was the War Relocation Authority? 4) What were the names and locations of the ten relocation centers? 5) How much did the WRA actually spend on food for the relocation centers? 6) The Japanese American farmers were very successful at raising food crops in the camps. In fact, they often produced more than could be used at their site. What did the government do with the surplus? 7) What happened to California's farming industry when the Japanese American farmers, sharecroppers, and laborers were in the camps? 8) What happened to California's fishing industry? 9) Almost all able-bodied adults (who were not in the military) had a job in camp. How much did they make in salary per month? 1) How do I purchase the home video or DVD? 2) Why is Norm Mineta not featured in Return to the Valley? 3) Where did you find your interview candidates? 4) How did you decide who would be in the program? 5) How did you decide which stories would make the final version? For a short period in March 1942, Japanese Americans were encouraged to move from their Pacific Coast homes to the interior of the country. A small number of families were able to take advantage of this and thus avoid incarceration. This small window in less than a month. The War Relocation Authority was a civilian government agency created to oversee the detention of Japanese Americans during World War I on March 18, 1942. It administered the so-called "relocation centers." Milton Eisenhower was initially appointed its director but was soon succeeded by Dillon Myer. 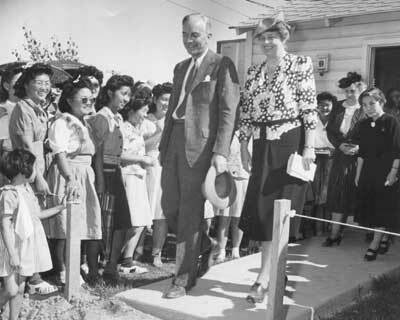 Dillon Myer, the national director of the WRA escorts First Lady, Eleanor Roosevelt on a tour of the Gila River Relocation Center. National Archives. With respect to the specific cost figures associated with mess operations, in the WRA's own book, "WRA: A story of human conservation," Vol. 9, pg. 102, it states "the purchasing of staple foods for relocation centers through designated depots of the Quartermaster Corps of the Army, expressly prohibited the purchase of "fancy grades" of food for the relocation centers, and stipulated that the menus for the centers should be based on a ration costing no more than 45 cents per person per day." They also explicitly noted that the cost of incarceree's rations should be less than those provided by the Army. Stephen Fugita at Santa Clara University states: I suspect that desert areas such as Manzanar probably "imported" certain agricultural items from other camps that had surpluses in particular crops. Places like Tule Lake and Gila River that were in agriculturally rich areas probably had surpluses in certain crops. According to WRA documents, able-bodied men started leaving the camps in 1943 and thus crimped the plans of the administration to produce great quantities of food. According to WRA documents, $74,000 of food produced in the centers was sold to the open market. The WRA explicitly wanted to sell to the national Food-for-Freedom program. Roughly, $3,650,000 worth was consumed by the incarcerees. The WRA estimates that the incarcerees produced 14% of their own food. When the evacuation orders were issued during the spring of 1942, most of the farmers had already planted the year's crop. In fact, the strawberries were just about ready to harvest. Some farmers were able to pick some of the crops before leaving, others had neighbors or non-Japanese farm workers willing to tend the fields and bring in the harvest, but the majority had to leave the crops to rot in the fields. Boats for sale, Terminal Island, California. National Archives. 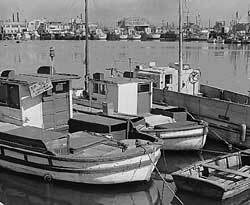 Most of the boats owned by Japanese Americans could not be sold at such short notice. Trawlers were quite specialized and expensive even in the 1940's. Many fishermen who owned their equipment outright, had to just abandon their boats and gear and hope that brokers could auction them off. Others who still had outstanding loans lost the equipment to the banks Ð who also auctioned them off. In Monterey, the other large group of fisherman were mostly Italian, and they took over most of the fishing jobs during the Japanese American internment. According to the WRA book "WRA: A story of human conservation, pg. 79: the "wages" were $12 for unskilled labor and persons undergoing vocational training; $16 for skilled labor and $19 for highly skilled and professional employees. Former Congressman and San Jose native, Norm Mineta was the city's first Japanese American Mayor. Without a doubt, Mr. Mineta's recollections of the resettlement period and the Redress movement would have added to the production. However, Mr. Mineta is now serving as the Secretary of Transportation under the Bush administration. KTEH was unable to interview him for the documentary because of scheduling constraints. Production of the documentary began shortly after the tragic events of 9/11. Though KTEH made several attempts to request an interview through the Department of Transportation media liaisons, the KTEH executive producer felt that Mr. Mineta had other greater and more pressing concerns at the time. The producer compromised by including the photo of Mr. Mineta and other community leaders at the signing of the Civil Liberties Act of 1988. All of our interviewees were volunteers and most have donated oral histories to the ReGenerations project done by the Japanese American Museum of San Jose. Community groups and the Return to the Valley historical advisors referred other possible interview participants. All candidates were pre-interviewed by the producer. Interview participants were chosen because they had a strong story or particular insight (such as strawberry growing or the changing role of women.) Emphasis was placed on geographic location as well. Many of our participants shared much more of their experiences than could fit into the constraints of a one-hour program. The production team felt that they should be arranged into "chapters" or topics and highlighted as extra footage on the home video and DVD versions. Funding for the documentary, Return to the Valley was provided by the California Civil Liberties Public Education Program (CCLPEP) the Community Foundation of Silicon Valley donor advised accounts, and the Henri and Tomoye Takahashi Charitable Fund. Documentary program: KTEH PBS, Copyright 2003. Photos: National Archives, Bancroft Library, and others as noted.